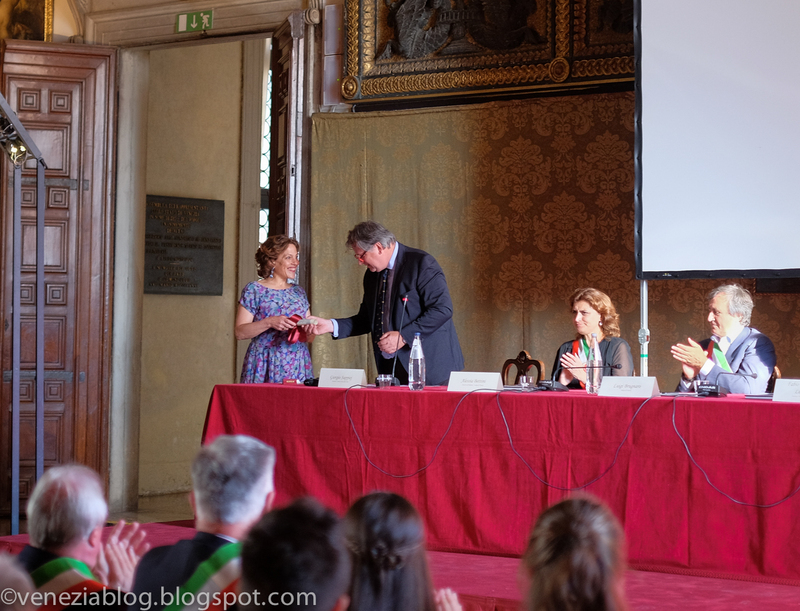 Two weekends ago Venice celebrated La Festa della Sensa, or its traditional ritual of "marrying" the sea, and as part of the weekend's festivities three Venetian residents were awarded the Premio Osella d'Oro della Sensa. The award--named after the gold coin once given out to senators by the doge--was intended to recognize the contribution of either institutions or individuals which/who have enriched the city through their efforts in the spheres of culture, crafts or commerce. Saverio Pastor, master craftsman of Venetian forcole (oarlocks) and remi (oars), long-time proponent of the culture of Venetian rowing and of Venetian artisans in general, and founder of El Felze, which his website describes as "an association of craftsmen involved in the construction of the gondola and its fittings, and articles of clothing for gondoliers." Michele Bugliesi, Chancellor of the Università Ca' Foscari, whose most recent achievement--and I think it's a significant one--was the inauguration of the International Center for the Humanities and Social Change on May 17, an interdisciplinary research program with centers in Europe and America devoted to the effects of globalization on contemporary society. In a city whose resident culture is literally fighting for its life in the face of mass tourism, irresponsible "development", and the ongoing, life-sucking 6 billion euro swindle that are the forever inoperable MOSE water gates, such residents and their efforts deserve not just to be celebrated but held up as examples of the kinds of things that must be done to keep the city alive. Alas, on the official website of the Comune di Venezia, and in local new reports, the focus was elsewhere. In the former case, a single sentence refers to the award, without bothering even to name its recipients. Then, that perfunctory bit of information done (the use of "però" in the following sentence is interesting), it boasts of the "increasing number of people" who come to Venice to view the marriage ceremony to the sea on the following day. Because, after all, if there's one thing Venice really needs it's more tourists. At the award ceremony itself, held in the Palazzo Ducale, Mayor Luigi Brugnaro's focus was also elsewhere. This year's establishment of a "twin city" relationship between Venice and l'Unione Montana Agordina in the Dolomites served as an opportunity for him to lay out a far-reaching vision of a Venice whose "brand" (his word) would extend to the mountains. Of course, as he noted, there had always been an important relationship between the Venice and the mountains, from which comes the city's water and raw building materials. But as he talked about Venice as "a great metropolitan area" stretching from the sea to the mountains, an area whose economic development should be conceived of as a unified bloc, I couldn't help remembering passages from Salvatore Settis's book If Venice Dies. 1) While discussing Pierre Cardin's now scuttled plans to build a massive skyscraper on the mainland near the lagoon, Settis writes that the "real issue facing all Venetians, the regeneration of the the former industrial zone of Marghera, has been hijacked to justify real estate speculation. As part of the bargain [of Cardin's proposed residential/commercial high-rise], a new highway planned in the vicinity would modernize Venice by making it look like a Chinese or American metropolis." Cardin's skyscraper plans may have collapsed beneath widespread public outrage, but similar developments on the mainland are still very much in the works. And perhaps it might be worth noting here that Brugnaro himself is said to own a great deal of property in Marghera. 2) Settis also notes that "Rethinking transit connections in order to save Venice from isolation"--a key point of Brugnaro's at the awards ceremony--"is yet another favorite theme of the high priests of the cargo cult. The Futurists thought they could fill the Grand Canal and pave it over, while their heirs today are planning a huge metropolitan area that would turn the cities of Venice, Padua, and Treviso into a single megapolis." To entertain any ideas other than those put forth by Venice's non-resident, mainland mayor is to be nothing but a weak-minded, sentimental crybaby (that "senza piangersi addosso" phrase above). But of course there are other ideas out there, put forth by people like Settis himself, and community groups such as Jane da Mosto's We Are Here Venice and Generazione 90, which are committed to maintaining Venice as something more than merely a "luxury brand." Indeed, Brugnaro's obsession with the notion of "luxury" and "luxury brands" seems to have come to its full rancid flowering in the current Biennale's embarrassing Venice Pavilion, whose very theme is "Luxus", and whose gaudy "trash" commodities on display are better suited to a suburban outlet mall or a cruise ship port than an international festival of art. And, in fact, an alternative vision of Venice's possible future is likely to be put to the vote this fall, in the form of a referendum proposing that Venice and Mestre be separated into two distinct cities--as they were before Mussolini bound them into a single comune. This topic merits a post of its own, which I'll soon put up. But, in short, the idea is that the issues facing Venice are quite different from those facing Mestre, and that each place would benefit from having its own mayor and administration. At present, the majority of the electorate whose votes determine the fate of Venice live on the mainland--as does Brugnaro himself (the first Venice mayor ever born and raised outside of the lagoon). Indeed, the very stridency of Brugnaro's remarks during the awards ceremony may have been inspired by his awareness of this proposed referendum--which he adamantly opposes, and which he has attempted (and thus far failed) to prevent from taking place. one of my main aims is to encourage citizens to understand the factors that determine our quality of life in the city, together with the limits of what's possible--in economic, social and environmental terms. In this way we will all be able to participate more knowledgeably, and more effectively, in political choices. We are here Venice is not a factory for trouble-makers [fabbrica di "rompiscatole": literally, "box breakers," but a common euphemism for "ball busters"--and the point at which da Mosto and Brugnaro exchanged smiles] but an incubator for citizens that adds value to their experience, understanding, and knowledge. Even if little is left of Venice (and the need to re-grow the population is urgent*), its value is still immeasurable in terms of history, culture, civilisation and, above all, its innate resilience. Venice is often considered a mirror on the world. Many of its problems are also found on a global scale. We have the privilege of living here and seeing everything close-up. If we don't manage to save Venice, how will the world save itself? 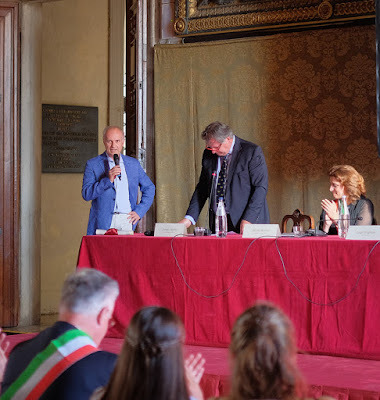 Even as the Comitato Festa della Sensa chose to recognize three Venetian residents for their efforts on behalf of a living Venice, the attention of the mayor and comune's publicity department was, as usual, elsewhere. 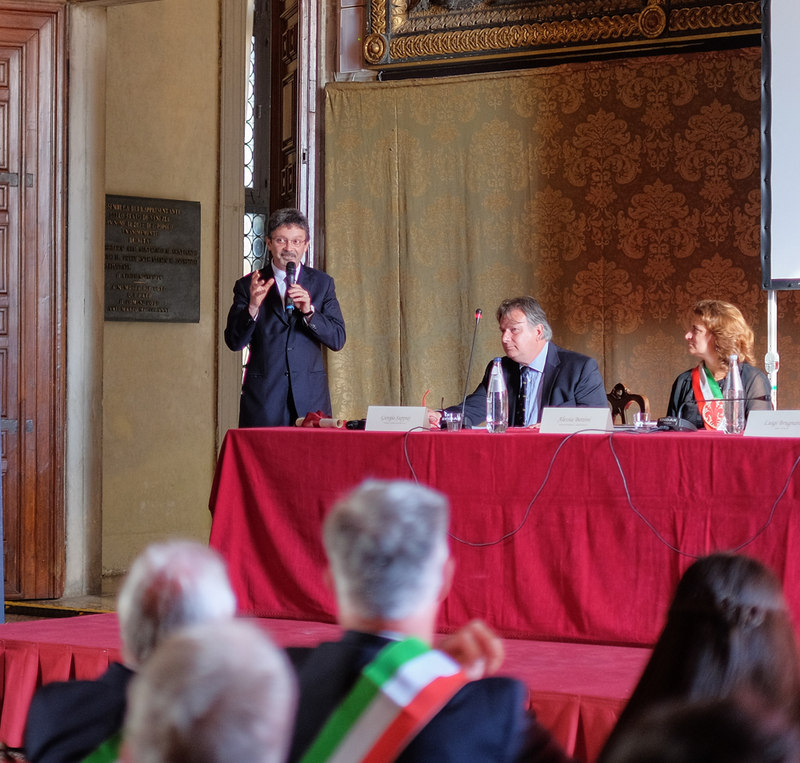 The referendum to separate Venice and Mestre is the best--and perhaps last--chance for the residents of Venice to once again have a say in the future of their city. The ceremony that took place in the grand Sala dello Scrutinio of the Palazzo Ducale on 27 May during the Festa della Sensa reminded me of everything at stake in that referendum. I'll post more information on it soon. *While campaigning for mayor Brugnaro promised to increase the resident population of Venice by 30,000 people. During his two years in office the city has in fact lost 1,600 residents. What Does the Real Venice Look Like?